When The Marat/Sade Journals, Barron Storey‘s astounding first published foray into the sequential art medium, was released in 1993 he had already earned much success and acclaim in the worlds of illustration and fine art. Recipient of the Society of Illustrators’ Gold Medal award in 1976 for his portrait of German songstress Lotte Lenya, Storey also has ten works (completed as Time magazine covers) in the permanent collection of the Smithsonian’s National Portrait Gallery. Of these the most famous is perhaps his portrait of Howard Hughes from 1976, drawn overnight while talking on the phone with the coroner describing the state of Hughes’ body. 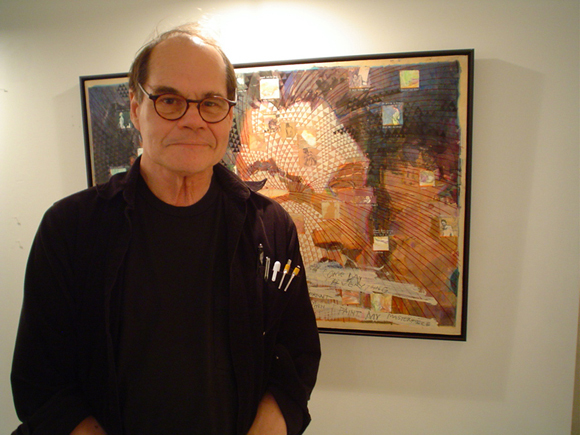 His cover for the 1980 edition of Lord of the Flies is credited as the key reason the book saw a sharp rise in sales, a spike in interest that lasted for several years after.Storey has also enjoyed a long career as a teacher and his past students include Kent Williams, Daniel Clowes, Bill Sienkiewicz, John Van Fleet, Peter Kuper, George Pratt, and Scott McCloud. He was approached by Kevin Eastman in the early 1990’s to compile pieces from his many illustrated journals into a collected edition (for the late, lamented Tundra Publishing imprint) and the result of this request would become the now (deservedly) legendary book The Marat/Sade Journals. As an avid reader of the Tundra releases, I was very interested in picking up the book, but the release (one of Tundra’s last) sold out quickly and became extremely hard to find. If a copy did become available, it came at a high price. As the stature of this release has grown to huge proportions through the years I’ve become more aware of Storey’s work, including his stellar contribution to the Eisner Award-winning graphic novel Sandman: Endless Nights. Now, over 15 years later, The Marat/Sade Journals is back in print in a lavish new, re-edited edition from Graphic Novel Art and I can state without hesitation that the book easily earns every word of acclaim it has ever received. As the book progresses, Storey’s personal story and internal conflicts begin to overlap and interact with events from the Peter Weiss play The Persecution and Assassination of Jean-Paul Marat as Performed by the Inmates of the Asylum of Charenton Under the Direction of the Marquis de Sade. Set in 1808, the story concerns insane asylum resident Marquis de Sade as he directs his fellow madmen in a play about the French Revolution (which has just ended the decade before.) Performed for Coulmier, the hospital’s director and avid supporter of the Revolution, de Sade and his performers use the opportunity to bluntly defy Coulmier’s authority. Inside the asylum walls the inmates are no more than disenfranchised citizens for whom the Revolution has done nothing. This particular play lends itself perfectly to the confessional nature of Storey’s work, as both function as stories within stories, parallel running narratives that become a cohesive whole as they continually (and increasingly) overlap as they near their conclusions. Interestingly, Storey infuses references into Marat/Sade from other seemingly disparate sources including Network, The Shining, One Flew Over The Cuckoo’s Nest, The Dresser, and Bob Dylan lyrics. In a newly written afterword to Marat/Sade, Storey explains that these interjections of dialog and characters that seeped into the book were simply favorites of his that he was revisiting at the time. It is truly a case of creative synchronicity that these background influences happen to fit his tale perfectly and only enhance what is already an incredible reading (and viewing) experience. Though it is only one small piece of the puzzle, there was a moment which utilized said references and actually made me laugh out loud. Make no mistake that Marat/Sade is a very dark and complex piece of work. This made it all the more surprising that a line from a Firesign Theatre comedy album turns up in the most unexpected place. On a page which foretells the violent assassination of Jean Paul-Marat by the female character Corday, the bottom of the image has a line in which Porgie Tirebiter, from the Firesign skit High School Madness, is interrupted during some “private time” when his mother tells him to come to breakfast. As the book reaches an emotional crescendo there is a moment of clarity in which the female antagonists from all of the various sources that the artist has been referencing come forward at once. Here The Marat/Sade Journals as a whole can be seen as a metaphor for Storey’s failed relationship with Kelly and perhaps also the other women in his life as well. The Marat/Sade Journals is an incredible and completely singular artistic journey for the reader. The combination of swirling text and complex imagery weaving in and out and around one another shows that the book adheres to the basic tenets of sequential storytelling, but you are not likely to find anything else like it at you local comic shop. 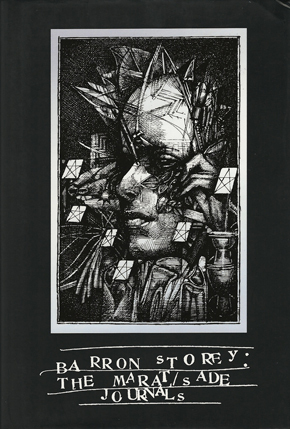 The only thing I could even begin to liken it to offhand is Dave McKean’s Cages, and as such it comes as no surprise that Storey’s work has had a huge influence on McKean. Neil Gaiman has been quoted as saying that “One of the treasures of my bookshelf is The Marat/Sade Journals.” After reading the work myself I can now say that it is one of the treasures of my bookshelf as well. Highest possible recommendation. Special thanks to Ryan Graff of Eidolon Fine Arts for making this article possible.